The Red Sox took care of one of their potential free-agents this morning, signing ace Chris Sale to a five-year, $145 million contract extension—which will start in the 2020 season. 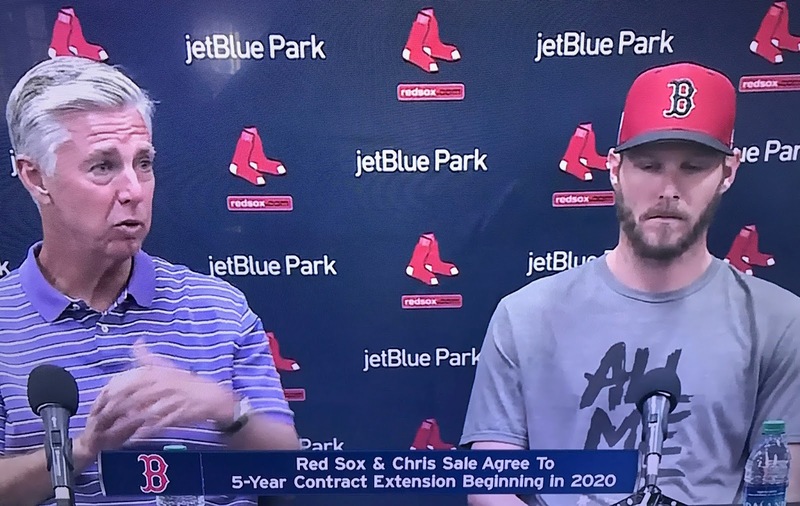 Sale will get a $15 million club option for 2019—then average $29 million a year over the following five seasons. The deal does include an opt-out after the 2022 season, but if the contract runs full, it will go through the 2024 season. Also, some of the $145 million is deferred money. Said Red Sox Manager Alex Cora, "Everyone knows how good he is and what he brings to the table, not only on the field but off the field. He’s one of the best." Since joining Boston, the lanky lefty has collected a ridiculous 545 strikeouts in just 372 1/3 innings. And, of course, he will forever be remembered for making Manny Machado pathetically whiff to end the 2018 World Series. Now, the Red Sox now have three potential free agents who could leave after this season—Xander Bogaerts, Rick Porcello and (if he exercises his opt-out) J.D. Martinez.